Istanbul, once known as the capital of capital cities, has many unique features. It is the only city in the world to straddle two continents, and the only one to have been a capital during two consecutive empires – Christian and Islamic. Once capital of the Ottoman Empire, Istanbul still remains the commercial, historical and cultural pulse of Turkey, and its beauty lies in its ability to embrace its contradictions. Ancient and modern, religious and secular, Asia and Europe, mystical and earthly all co-exist here. Its variety is one of Istanbuls greatest attractions: The ancient mosques, palaces, museums and bazaars reflect its diverse history. The thriving shopping area of Taksim buzzes with life and entertainment. And the serene beauty of the Bosphorus, Princes Islands and parks bring a touch of peace to the otherwise chaotic metropolis. How about some inspiration? We’ve been customizing luxury vacations to Istanbul for discriminating travelers for 20 years. It helps us help you, if you begin with our vacation planner . You’ll have a thrilling vacation, get the best airfare, enjoy privileged access with luxury amenities and special touches. We’ll save you time and prevent costly mistakes. Golden Horn: This horn-shaped estuary divides European Istanbul. One of the best natural harbours in the world, it was once the centre for the Byzantine and Ottoman navies and commercial shipping interests. Today, attractive parks and promenades line the shores, a picturesque scene especially as the sun goes down over the water. At Fener and Balat, neighbourhoods midway up the Golden Horn, there are entire streets filled with old wooden houses, churches, and synagogues dating from Byzantine and Ottoman times. The Orthodox Patriarchy resides at Fener and a little further up the Golden Horn at Eyup, are some wonderful examples of Ottoman architecture. Muslim pilgrims from all over the world visit Eyup Camii and Tomb of Eyup, the Prophet Mohammedâ„¢s standard bearer, and it is one of the holiest places in Islam. The area is a still a popular burial place, and the hills above the mosque are dotted with modern gravestones interspersed with ornate Ottoman stones. The Pierre Loti Cafe, atop the hill overlooking the shrine and the Golden Horn, is a wonderful place to enjoy the tranquility of the view. Beyolu and Taksim: Beyoglu is an interesting example of a district with European-influenced architecture, from a century before. Europe’s second oldest subway, Tunel was built by the French in 1875, must be also one of the shortest” offering a one-stop ride to start of Taksim. Near to Tunel is the Galata district, whose Galata Tower became a famous symbols of Istanbul, and the top of which offers a tremendous 180 degree view of the city. From the Tunel area to Taksim square is one of the city’s focal points for shopping, entertainment and urban promenading: Istiklal Cadesi is a fine example of the contrasts and compositions of Istanbul; fashion shops, bookshops, cinemas, markets, restaurants and even hand-carts selling trinkets and simit (sesame bread snack) ensure that the street is packed throughout the day until late into the night. The old tramcars re-entered into service, which shuttle up and down this fascinating street, and otherwise the street is entirely pedestrianised. There are old embassy buildings, Galatasaray High School, the colourful ambience of Balik Pazari (Fish Bazaar) and restaurants in Cicek Pasaji (Flower Passage). Also on this street is the oldest church in the area, St Mary’s Draperis dating back to 1789, and the Franciscan Church of St Antoine, demolished and then rebuilt in 1913. The street ends at Taksim Square, a huge open plaza, the hub of modern Istanbul and always crowded, crowned with an imposing monument celebrating Attaturk and the War of Independence. The main terminal of the new subway is under the square, adjacent is a noisy bus terminal, and at the north end is the Ataturk Cultural Centre, one of the venues of the Istanbul Theatre Festival. Several five-star hotels are dotted around this area, like the Hyatt, Intercontinental and Hilton (the oldest of its kind in the city). North of the square is the Istanbul Military Museum. Taksim and Beyoglu have for centuries been the centre of nightlife, and now there are many lively bars and clubs off Istiklal Cadesi, including some of the only gay venues in the city. Beyoglu is also the centre of the more bohemian arts scene. Sultanahmet: Many places of tourist interest are concentrated in Sultanahmet, heart of the Imperial Centre of the Ottoman Empire. 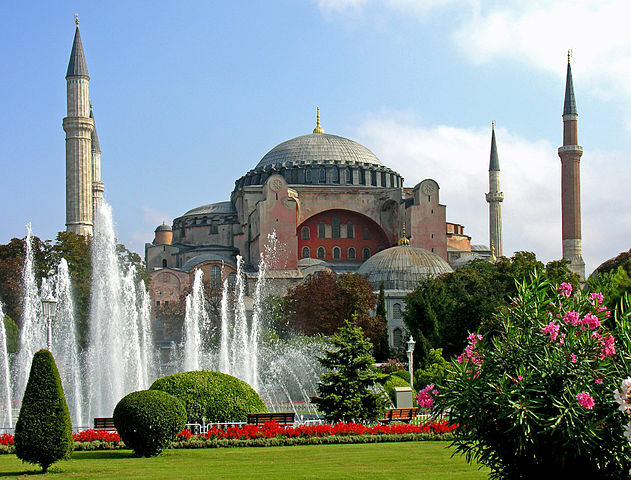 The most important places in this area, all of which are described in detail in the Places of Interest section, are Topkapi Palace, Aya Sofia, Sultan Ahmet Camii (the Blue Mosque), the Hippodrome, Kapali Carsi (Covered Market), Yerebatan Sarnici and the Museum of Islamic Art. Ortakaty: Ortakoy was a resort for the Ottoman rulers because of its attractive location on the Bosphorus, and is still a popular spot for residents and visitors. The village is within a triangle of a mosque, church and synagogue, and is near Ciragan Palace, Kabatas High School, Feriye, Princess Hotel. Saratyer: The first sight of Saratyer is where the Bosphorus connects with the Black Sea, after the bend in the river after Tarabya. Around this area, old summer houses, embassies and fish restaurants line the river, and a narrow road which separates it from Buyukdere, continues along to the beaches of Kilyos. 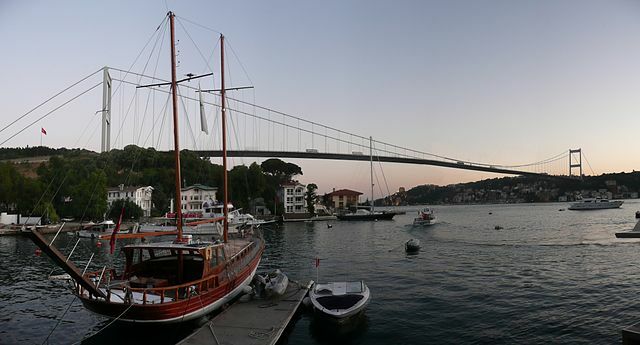 Saratyer and Rumeli Kavayaty are the final wharfs along the European side visited by the Bosphorus boat trips. Both these districts, famous for their fish restaurants along with Anadolu Kavagi, get very crowded at weekends and holidays with Istanbul residents escaping the city. After these points, the Bosphorus is lined with tree-covered cliffs and little habitation. The Sadberk Hanim Museum, just before Sariyer, is an interesting place to visit; a collection of archaeological and ethnographic items, housed in two wooden houses. A few kilometres away is the huge Belgrade Forest, once a haunting ground of the Ottomans, and now a popular weekend retreat into the largest forest area in the city. Acsladar: Relatively unknown to tourists, the suburb of Acskadar, on the Asian side of the Bosphorus, is one of the most attractive suburbs. Religiously conservative in its background, it has a tranquil atmosphere and some fine examples of imperial and domestic architecture. 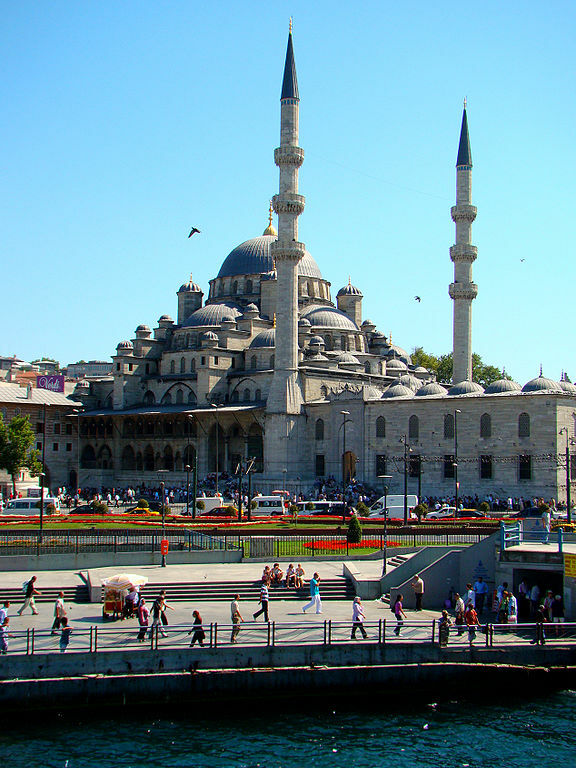 The Iskele, or Mihrimah Camii is opposite the main ferry pier, on a high platform with a huge covered porch in front, often occupied by older local men watching life around them. Opposite this is Yeni Valide Camii, built in 1710, and the Valide Sultanas green tomb rather like a giant birdcage. The Cinili Mosque takes its name from the beautiful tiles which decorate the interior, and was built in 1640. 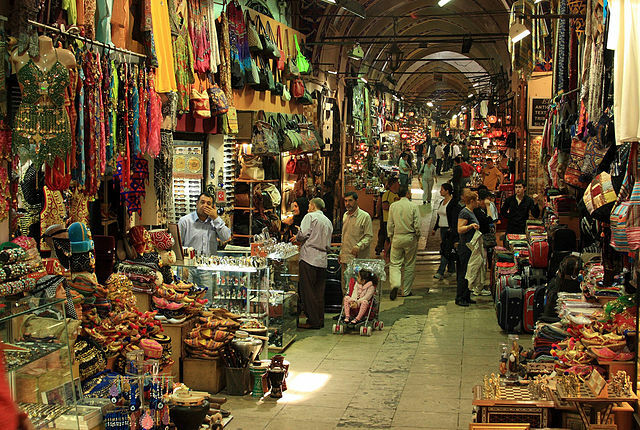 Apart from places of religious interest, Uskudar is also well known as a shopping area, with old market streets selling traditional local produce, and a good fleamarket with second hand furniture. There are plenty of good restaurants and cafes with great views of the Bosphorus and the rest of the city, along the quayside. In the direction of Haydarpasa is the lhe Karaca Ahmet Cemetery, the largest Muslim graveyard in Istanbul. The front of the Camlica hills lie at the ridge of area and also offer great panoramic views of the islands and river. Kadakay: Further south along the Bosphorus towards the Sea of Marmara, Kadakay has developed into a lively area with up-market shopping, eating and entertainment making it popular especially with wealthy locals. Once prominent in the history of Christianity, the 5th century hosted important consul meetings here, but there are few reminders of that age. It is one of the improved districts of Istanbul over the last century, and fashionable area to promenade along the waterfront in the evenings, especially around the marinas and yacht clubs. Bagdat Caddesi is one of the most trendy” and label-conscious” fashion shopping streets, and for more down-to-earth goods, the Gen Azim Gunduz Caddesi is the best place for clothes, and the bit pazari on Ozelellik Sokak is good for browsing through junk. In the district of Moda, is the Benadam art gallery, as well as many foreign cuisine restaurants and cafes. Haydarpaaya: To the north of Kadikoy is Haydarpasa, and the train station built in 1908 with Prussain-style architecture which was the first stop along the Baghdad railway. Now it is the main station going to eastbound destinations both within Turkey, and internationally. There are tombs and monuments dedicated to the English and French soldiers who lost their lives during the Crimean War (1854-56), near the military hospital. The north-west wing of the 19th Century Selimiye Barracks once housed the hospital, used by Florence Nightingale to care for soldiers, and remains to honour her memory. Polonezka: Polonezkay, although still within the city, is 25 km. away from the centre and not easy to reach by public transport. Translated as village of the Poles, the village has a fascinating history: It was established in 1848 by Prince Czartorisky, leader of the Polish nationals who was granted exile in the Ottoman Empire to escape oppression in the Balkans. During his exile, he succeeded in establishing a community of Balkans, which still survives, on the plot of land sold to him by a local monastery. Since the 1970s the village has become a popular place with local Istanbulites, who buy their pig meat there (pig being forbidden under Islamic law and therefore difficult to get elsewhere). All the Poles have since left the village, and the place is inhabited now by wealthy city people, living in the few remaining Central European style wooden houses with pretty balconies. What attracts most visitors to Polonezkoy is its vast green expanse, which was designated Istanbul’s first national park, and the walks though forests with streams and wooden bridges. Because of its popularity, it gets crowded at weekends and the hotels are usually full. Kilyos: Kilyos is the nearest beach resort to the city, on the Black Sea coast on the European side of the Bosphorus. Once a Greek fishing village, it has quickly been developed as a holiday-home development, and gets very crowded in summer. Because of its ease to get there, 25km and plenty of public transport, it is good for a day trip, and is a popular weekend getaway with plenty of hotels, and a couple of campsites. Ãzile: A pleasant, small holiday town, Åzile lies 50 km from Acskadar on the Black Sea coast and some people even live here and commute into Istanbul. The white sandy beaches are easily accessible from the main highway, lying on the west, as well as a series of small beaches at the east end. The town itself if perched on a clifftop over looking the bay tiny island. There is an interesting French-built black-and-white striped lighthouse, and 14th century Genoese castle on the nearby island. Apart from its popular beaches, the town is also famous for its craft; Sile bezi, a white muslin fabric a little like cheesecloth, which the local women embroider and sell their products on the street, as well as all over Turkey. The town has plenty of accommodation available, hotels, guest houses and pansiyons, although can get very crowded at weekends and holidays as it is very popular with people from Istanbul for a getaway, especially in the summer. There are small restaurants and bars in the town. Princeâ„¢s Islands: Also known as Istanbul Islands, there are eight within one hour from the city, in the Marmara Sea. Boats ply the islands from Sirkeci, Kabatas and Bostanci, with more services during the summer. These islands, on which monasteries were established during the Byzantine period, was a popular summer retreat for palace officials. It is still a popular escape from the city, with wealthier owning summer houses. Buyukada has long had a history of people coming here in exile or retreat; its most famous guest being Leon Trotsky, who stayed for four years writing ËœThe History of the Russian Revolution. The monastery of St George also played host to the granddaughter of Empress Irene, and the royal princess Zoe, in 1012. The southern hill, Yule Tepe, is the quieter of the two and also home of St Georgeâ„¢s Monastery. It consists of a series of chapels on three levels, the site of which is a building dating back to the 12th century. In Byzantine times it was used as an asylum, with iron rings on the church floors used to restrain patients. On the northern hill is the monastery Isa Tepe, a 19th century house. The entire island is lively and colourful, with many restaurants, hotels, tea houses and shops. There are huge well-kept houses, trim gardens, and pine groves, as well as plenty of beach and picnic areas. Burgazada Smaller and less of a tourist infrastructure is Burgazada. The famous Turkish novelist, Sait Faik Abasa lived here, and his house has been turned into a museum dedicated to his work, and retains a remarkable tranquil and hallowed atmosphere. Heybeliada Island of the Saddlebaga, because of its shape, is loved for its natural beauty and beaches. It also has a highly prestigious and fashionable watersports club in the northwest of the island. One of its best-known landmarks is the Greek Orthodox School of Theology, with an important collection of Byzantine manuscripts. 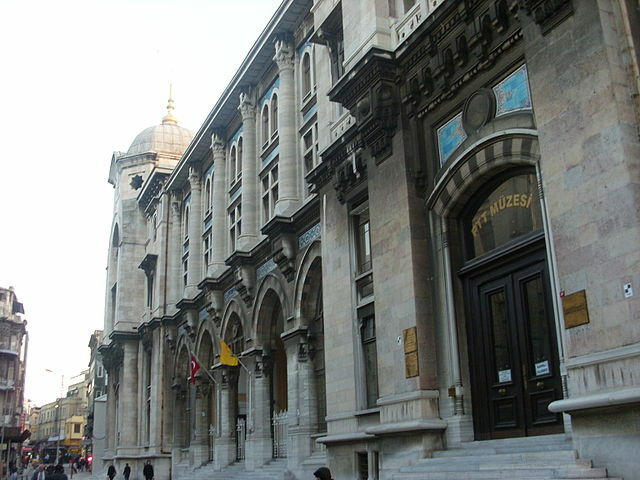 The school sits loftily on the northern hill, but permission is needed to enter, from the Greek Orthodox Patriarchate in Fener. The Deniz Harp Okulu, the Naval High School, is on the east side of the waterfront near the jetty, which was originally the Naval War Academy set up in 1852, then a high school since 1985. Walking and cycling are popular here, plus isolated beaches as well as the public Yoruk Beach, set in a magnificent bay. There are plenty of good local restaurants and tea houses, especially along Ayyd Caddesi, and the atmosphere is one of a close community. Environment: Wide beaches of Kilyos at European side of Black Sea at 25th km. 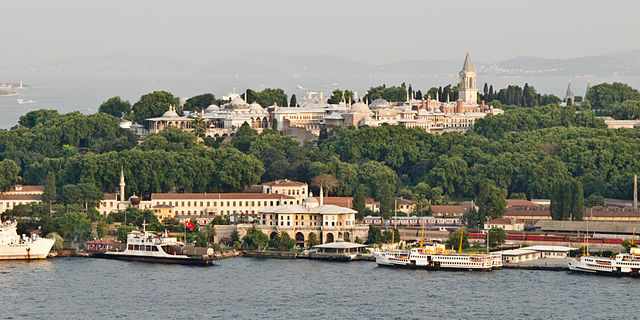 outside Istanbul, are attracting Istanbul residents during summer months. Belgrade Forest, inside from Black Sea, at European Side is the widest forest around Istanbul. Istanbul residents, at week ends, come here for family picnic with brazier at its shadows. Sweet Eskihisar fisherman borough, to whose marina can be anchored by yachtsmen after daily voyages in Marmara Sea is at south east of Istanbul. Turkey’s 19th century famous painter, Osman Hamdi Bey’s house in borough is turned into a museum. Hannibal’s tomb between Eskihisar and Gebze is one of the sites around a Byzantium castle. 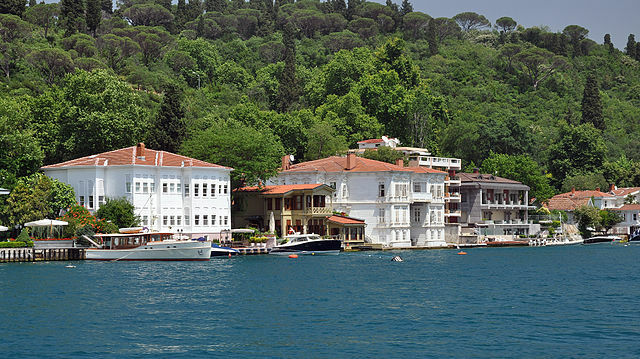 There are lots of Istanbul residents’ summer houses in popular holiday place 65 km. away from Istanbul, Silivri. This is a huge holiday place with magnificent restaurants, sports and health centers. Conference center is also attracting businessmen, who are escaping rapid tempo of urban life for “cultural tourism” and business – holiday mixed activities. Scheduled sea bus service is connecting Istanbul to Silivri. Islands within Marmara Sea, which is adorned with nine islands, was the banishing place of the Byzantium princes. Today they are now wealthy Istanbul residents’ escaping places for cool winds during summer months and 19th century smart houses. Biggest one of the islands is Bakada. You can have a marvelous phaeton travel between pine trees or have a swim within one of the numerous bays around islands!